There’s always something new to say about Carl Gustaf Mannerheim. And I don’t mean lurid innuendo about his private life, or schmuck-baiting insinuations about his sexuality. Finland’s beloved Marshal is orbited by a publishing industry that now includes a Mannerheim cookbook and a Mannerheim comic, with a history that touches on a dozen countries. He was a truly cosmopolitan figure, the “last knight” of the Tsarist aristocracy and a hero of the nascent Finnish nation. He saw the prophetic trench conflict of that grotty little war between Russia and Japan over Manchuria, and he witnessed the twilight days of two empires. His epic ride across Asia in 1906-8 would have been the crowning glory of his career, were it not for the intervention of wider world events in his forties. But with a life overshadowed by his role in the Finnish Civil War and World War Two, his arduous reconnoitring of China remains largely forgotten. Across Asia, his mammoth account of his journey, was not published until 1940, and even then in a limited run of only 500 copies. It has taken until the 21st century for the scholar Harry Halén to publish a restored retranslation that brought Mannerheim’s Asian adventure to a wider audience, and several further years for someone to publish the inevitable companion, a modern travelogue that traverses Asia in Mannerheim’s footsteps – The Horse That Leaps Through Clouds: A Tale of Espionage, the Silk Road and the Rise of Modern China. Like Mannerheim before him, Tamm travels undercover. He gets annoyed with his interpreters and jumpy in the presence of the Army, ever unsure who has shopped him and who is watching. But he also meets the movers and shakers of his age, and powerful evocations of the past, such as his encounter with the great-great-grandson of the woman Mannerheim knew as the Queen of the Alai Kirghiz. Tamm’s text fleshes out Mannerheim’s journey with historical contexts and adds data unknown in 1906. There is much written about photographs taken and images seen, but these are oddly absent from the book itself, at least in this hardback edition. For the full experience of “reading” Tamm’s journey, one must also have a web browser open to his richly appointed website of parallel resources. Tamm has shown himself to be a shrewd manipulator of modern media, and offers Tweets, Facebookery and a blog to enhance the experience. 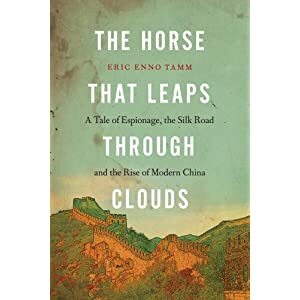 One wonders if The Horse That Leaps Through Clouds awaits a true destiny, perhaps after its US appearance, likely awards and hopeful best-sellerdom, when foreign rights buyers decide to incorporate pictures by both Mannerheim and Tamm into editions in French, Russian, Swedish, or Finnish – the most likely territories to jump at the chance for translation rights. I don’t see it coming out in Chinese in a hurry, though Tamm will take that as a compliment. Tamm undertook his journey in 2006, and must surely have been planning to publish in 2008, on the centenary of Mannerheim’s return from the Far East, or 2009, the centenary of Mannerheim’s report on China. Perhaps because of the publication of Halén’s revised book, perhaps for complex reasons to do with award qualification and publicity, The Horse That Leaps Through Clouds has an official US publication date of 2011, but has sneaked out in hardback in its native Canada several months early, offering an irresistible temptation to anyone looking for an exclusive Christmas present for the Mannerheim fan in their life. The book alludes to James Palmer’s Bloody White Baron as forthcoming, and includes Paul Pelliot’s Carnets de Route in its bibliography, although it does not dig too deeply into Pelliot’s rich veins of anti-Mannerheim invective. All of which I take to mean that Tamm’s book was delivered to his publishers at roughly the same time as my own – I only squeezed Pelliot in during the revision stage. If so, this would explain why there is no mention of Mannerheim: President, Soldier, Spy in Tamm’s otherwise thorough bibliography. My book must have come out while his was going through galleys, which makes it all the more fun to find him elucidating points I only skim, or asking questions that my own book answers. Both of us break with tradition by making Mannerheim’s Asian trip the centrepiece of his life, contrasted with earlier writers who place WW2 in the foreground. Moreover, we are both unrepentant in our assertion that Mannerheim was a Tsarist spy, a concept that has been vigorously denied by at least one diplomat, although even at the time, I thought he protested a little too much. This entry was posted in News and tagged China, Eric Enno Tamm, Horse That Leaps, Mannerheim by ixarette. Bookmark the permalink. Sounds like the perfect companion to your own tome. Double-bill ahoy! Now up on Tamm’s website, translated extracts from Mannerheim’s Preliminary Report on the Trip Undertaken by Imperial Order Across Chinese Turkestan and the Northern Provinces of China to Peking in 1906–07 and 1908, as well as a download of the entire text in Russian.